For those not satisfied with the 16GB Acer Iconia Tab A500, a 32GB model will soon be made available. Certain official accessories for the tablet are also now on sale. While the 16GB Iconia Tab A500 launched in the U.S. at a reasonable $450 price point, the new 32GB model will supposedly be just $50 more. In fact, online retailer J&R is currently accepting pre-orders for the new model. Additional differences, if any, aside from the larger SSD are currently unknown. 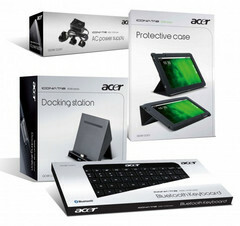 Existing owners of the Acer tablet can now complement their device with a range of official accessories. These include docking stations, protective cases, traveler packs, and the all-important Bluetooth keyboard. These are currently available through Amazon for $89, $39, $29, and $69, respectively. Unfortunately, an official launch date for the 32GB version is still up in the air. The release shouldn't be far off, however, especially since it is already available for pre-ordering. The 10.1-inch Acer Iconia Tab A500 runs on Android 3.0 with a Tegra 2 processor, 1GB RAM, HDMI, front and rear cameras, and micro USB. The device was first introduced earlier this year at CES 2011.